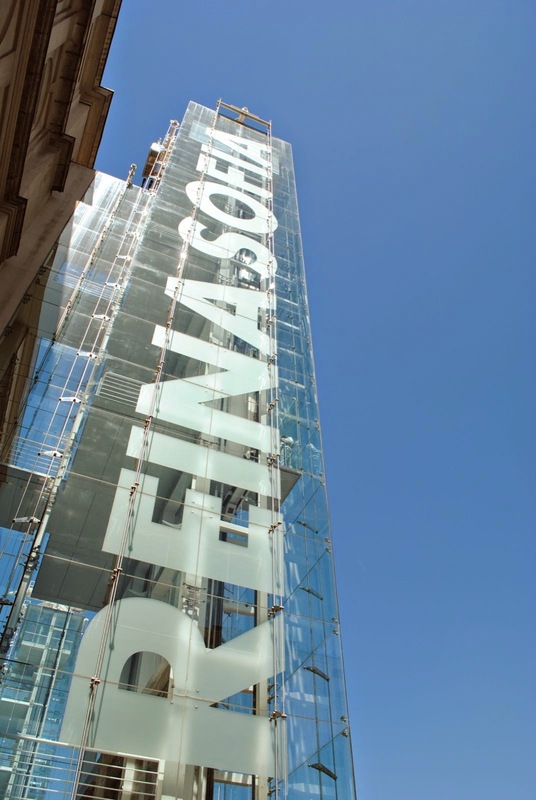 We'd heard that quite a few attractions are closed on Mondays in Madrid, so we decided to visit the Reina Sofia that we knew was definitely open. As we strolled down the hill from the Huertas district where we were staying it felt like we'd stepped outside of the main tourist area for the first time and were mixing it with just locals for the first time. I enjoyed checking out the windows of a couple of patisseries and bike shops as we went, as well as spying a Museo del Jamon on the other side of the road. Next to the Reina Sofia is the Atocha train station where we'd be heading to Seville from in a couple of times. We'd heard the train station was worth a visit in its own right so we decided to check it out before museum. As train stations go it was pretty impressive. The old train shed has been restored and converted into what feels like a large palm house, with lots of trees growing inside and a large turtle colony in one of the pools. We spent quite a while watching the turtles trying to climb out of the pool and bask in the sunshine. It was absorbing to watch them climb up and over each other, repeatedly falling back in and then giving it another go, to get out of the water. Tearing ourselves away from the turtles he had a quick spin round the rest of the station before heading across the road to the Reina Sofia. Just like the Prado the night before it was another grand old building with two striking lift shafts bolted onto the front of the museum (above). The building is laid out around a central courtyard which meant we could do loops round each floor. We started on the ground floor and the two exhibitions that stuck in the mind were one on Revolution & Decolonisation and the second called Playgrounds charting the history of, unsurprisingly, playgrounds. I'd never previously given any thought to playgrounds and it was interesting to discover that they were a late 19th Century and to see how they've evolved and the different ideologies across the world have gone into designing them over the years. Having completed the ground floor it was time for some lunch. Luckily our tickets enabled us to come and go as we pleased all day so we decided to try and find a menu del dia at a nearby restaurant for lunch. We walked down the Calle Argumosa with nowhere really taking our fancy. We eventually ended up in Casa de Asturias, not because it looked better than anywhere else, but because we'd reached the end of the street and our indecision couldn't last any longer! The menu del dia was some middle of the road stodge, but you couldn't really know the value at 11 EUR per person for three courses including a beer. It was also a voyage of discovery with my limited Spanish meaning I was effectively ordering blind. The highlight was probably the set custard dessert. Fortified form lunch we headed back to the Reina Sofia to see a bit more of the museum. We took one of the impressive glass elevators up to the first floor to have a look round. The exhibitions contained a lot of late 19th and 20th Century art by Spanish artists, with a focus on the war years and Franco era. We'd run out of energy by the time we'd finished looking round the floor so decided to head into the central courtyard to relax. After a quick sit down it was time to head back to our apartment to get ready for the food tour we'd booked for that evening.